When providence has destined two people for each other, it doesn’t matter how far circumstance pull s them apart, they will always have one or two chances of encounter orchestrated by the invincible hand of destiny. 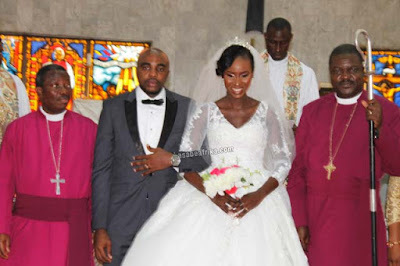 Such is the amazing love story of Edo state born big boy Osagie Elaiho and Uyioghosa, the pretty daughter of veteran Publisher of Conscience International Magazine, High Chief Abiola Ogundokun. 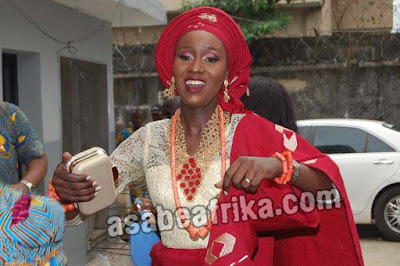 On Friday, August 25th, Uyi and her husband had their traditional marriage inside her father’s FESTAC, Lagos mansion home in the glare of everybody. The next Saturday, August 27th, it was a great moment as family, friends and well wishers joined the couple at Arch Bishop Vinning Memorial Church, GRA Ikeja as they both said ‘I Do’ to each other. 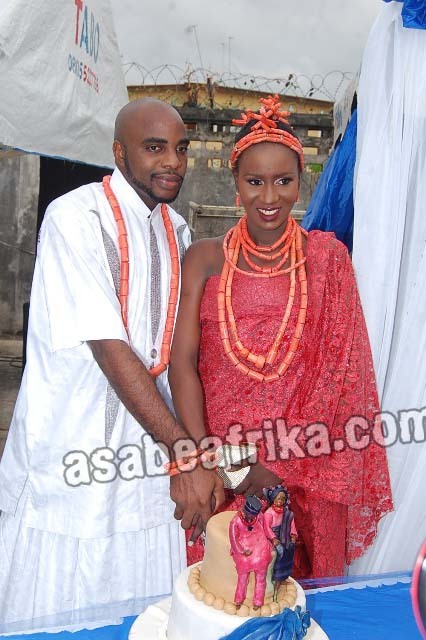 Your Africa’s Number 1 Celebrity Encounter Blog, Asabeafrika picks bits and briefs from the twin event. For Osagie, their remarkable journey to matrimony started at a mutual friends’ party in Lagos some 18 months ago where he sighted Uyi and immediately fell in love with her. 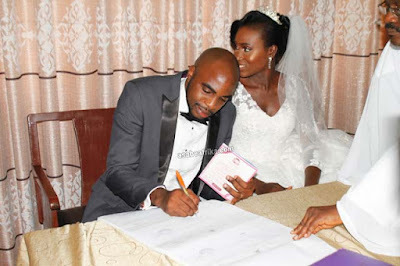 It was love at first sight for the very handsome Edo State born Economist. 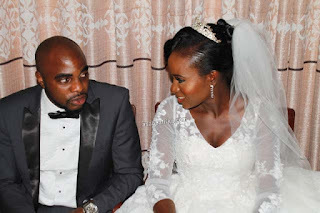 And for Uyi who equally studied economics, remarkable features like self discipline, love, Godliness and a rare strength of character proved Osagie to be the right man to father her unborn kids. 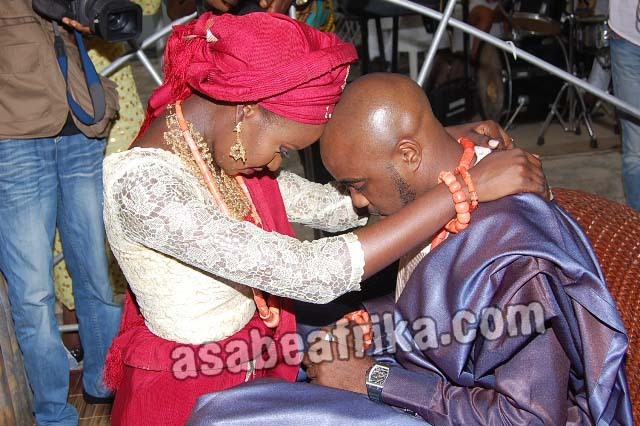 “He is matured, disciplined and Godly” she told Asabeafrika few hours after her August 26th traditional marriage. Osagie is the first son of a Benin born cultural icon and fine art designer extra-ordinary/hotelier, Chief Jerome Ikponmwoghodua Elaiho. 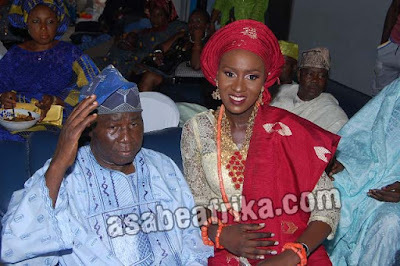 Chief Jerome Elaiho is the founder of Jeromelaiho Printing Press while Uyioghosa who like to describe herself as ‘Child of the Most High’ is one of the beautiful daughters of Iwo born PDP chieftain and Media baron, High Chief Abiola Ogundokun. 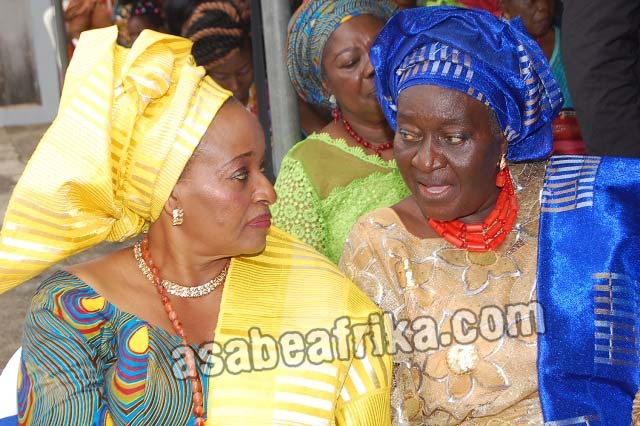 At the August event was Uyi’s lovely mother and ex-wife of the Iwo born Politician, Madam Usulobu Erhabor a former Assistant Commissioner of Police who is now a magistrate in Edo State (South-South Nigeria) Judiciary. 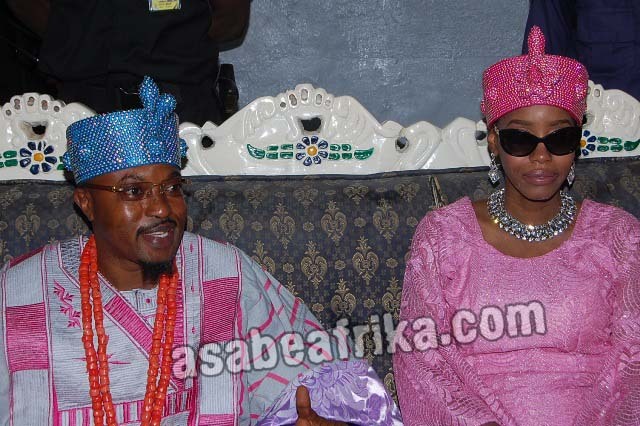 Chief Abiola Ogundokun met the young and pretty lady Usulobu Erhabor (fondly called US Erhabor) several years back through a late Commissioner of Police friend and the short romance led to the birth of Uyioghosa. 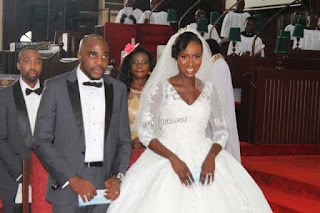 Both the Chief and his ex were happy as friends, well wishers and family filed out to celebrate Uyi and her dashing husband, Osagie on August 25. Apart from a larger member of the royal Ogundokun family of Iwo land who came to felicitate with High Chief Abiola Ogundokun, other children of Chief Ogundokun who graced their half sister’s wedding ball are; Mr. Idris Ogundokun who stormed the event with his pretty wife Lateefat and their newly born baby girl. 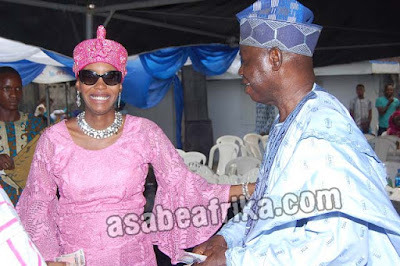 Idris who is a carbon copy of Chief Abiola Ogundokun is a business man. 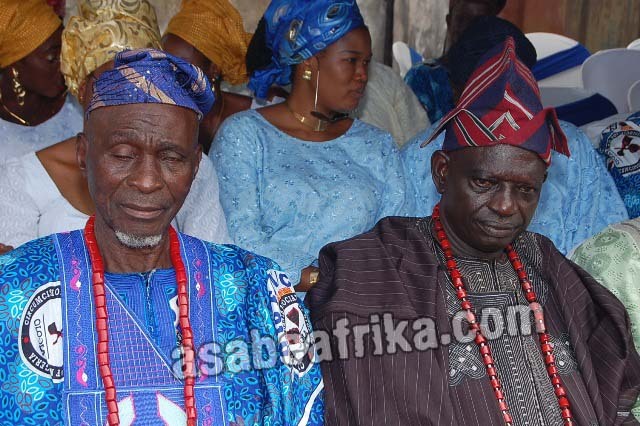 The other ones are Mr. Sunday Oluwole Ogundokun an Agric expert and Mr. Afolabi Ogundokun, a custom officer. 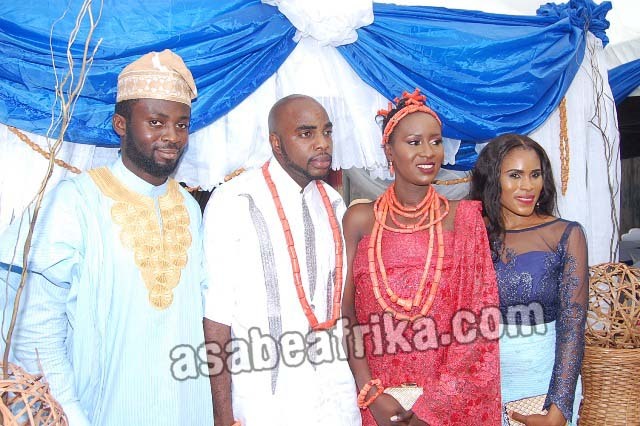 Two other beautiful daughters of the Iwo born publisher also came for Uyi’s marriage. They are; Mrs. Opeyemi Olowe (Nee Ogundokun) who works with a new generation bank and Mrs. Funmilayo Ogundokun, an insurance expert. They all stormed the event to give their half sister their support as she marches out of spinsterhood into matrimony. 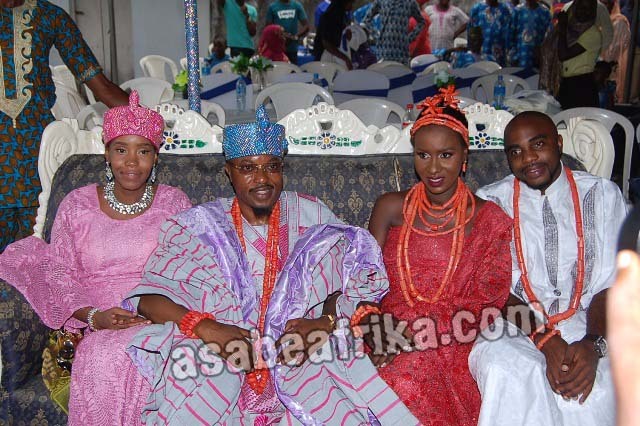 Their big uncle, Mr. Dekunle Ogundokun was also at hand to ensure things went smoothly at the August event. The traditional marriage which was to start at 11 am started at 1pm with the arrival of the Oluwo of Iwo land, His Imperial Majesty Oba Abdulrasheed Adewale Akanbi (Ilufemiloye Telu 1) who arrived Chief Ogundokun’s house with his pretty wife, Olori Chanel Akanbi (A Jamaican) and a retinue of aides and security escorts. 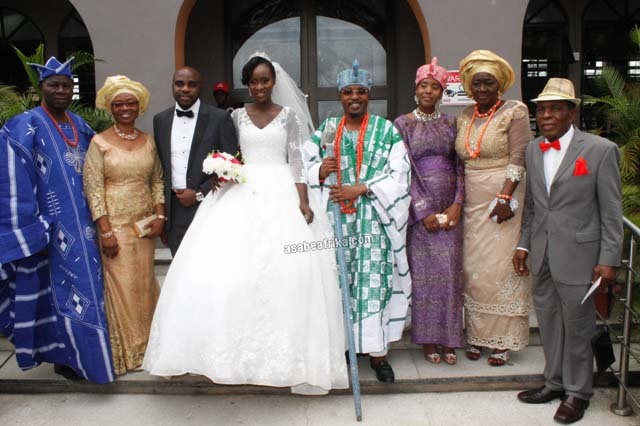 The Kabiyesi and his Olori were immediately led into the inner guest room of the very expansive mansion. 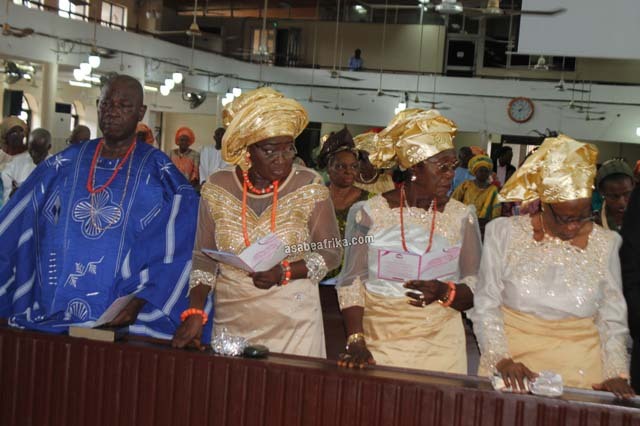 High Chief Abiola Ogundokun is the Otun Balogun and Balogun Musulumi of Iwo land and one of the highly respected Iwo Indigenes in the world. Chief Ogundokun who stood for an hour at the gate of his Festac home in Lagos to welcome the Iwo monarch was finally relieved at the sight of the convoy of the first class king as it birthed at the gate of his FESTAC home in grand style. 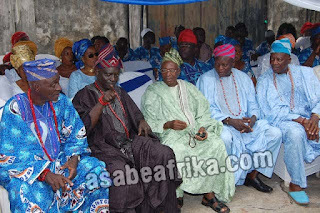 Some of the Obas who stormed Chief Abiola Ogundokun’s home for Uyi and Osagie’s marriage are; Oba Kazeem Adio Ori Oye , the Onigege of Igege land under Ola-Oluwa LGA, Osun State. 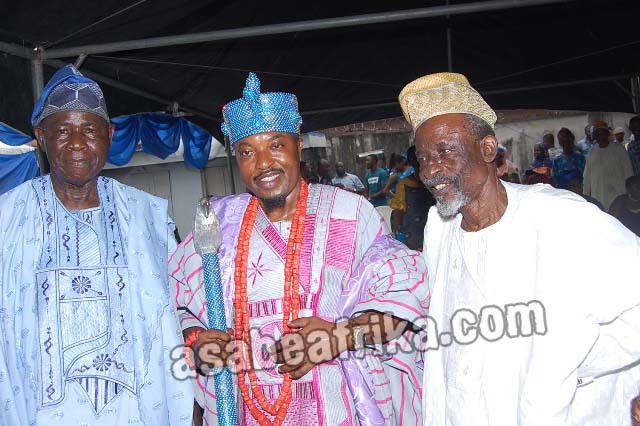 Oba Asimiu Sodiq Agboluaje, the Ologuro of Oguro land under Iwo LGA, Osun State. 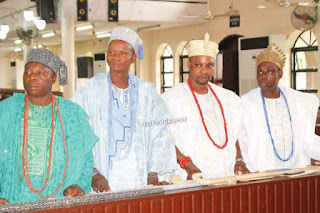 Oba Moshood Alamu (Oparaoke 1); the Onisara of Seesu in Iwo LGA; Oba Ogunleye Sikiru Omoyemi (Oyewale 1), the Olowu of Ilemowu under Olaoluwa LGA, Osun State and many other very important chiefs from Iwo land and environs. 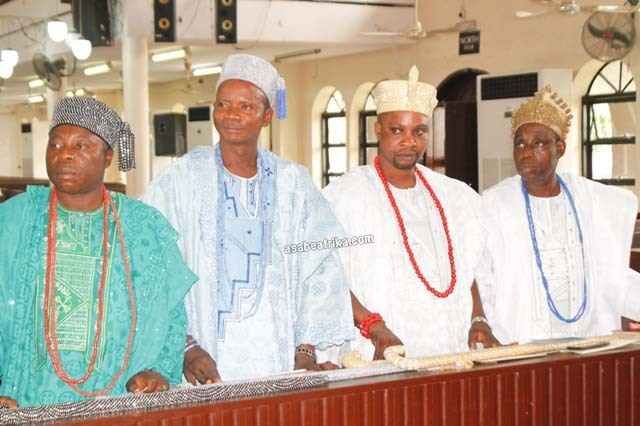 All the 5 Obas escorted the Oluwo to Chief Ogundokun’s house as a mark of respect. The groom’s father, Mr. Jerome Elaiho is a renowned artist of over 50 years in artindustry. 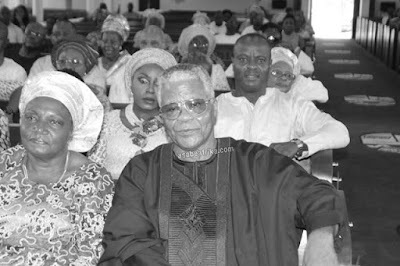 The 71 years old arts guru studied graphic arts and painting at Yaba College of Technology, Lagos before proceeding to Hornsey College of Arts (Now University of the arts in London) to study fine arts and design. He is reputed to be a gifted graphic artist whose industry and expertise cut across designing of book covers, calendars, diaries, journals and magazines for government parastatals, corporate organizations and individuals. The elder Elaiho who came with family, friends and relatives to beg Chief Ogundokun for his daughter Uyi to marry his son, Osagie is a fine art designer who has a professional reputation for designing buildings, structures, landscapes, flower gardens, swimming pools, trade fairs and exhibition pavilions. Married to Lady Stella Elaiho the beautiful mother of his children and a doctorate degree holder in law; they both stormed Chief Ogundokun’s FESTAC home to ask for Uyi’s hand in marriage with other family members. 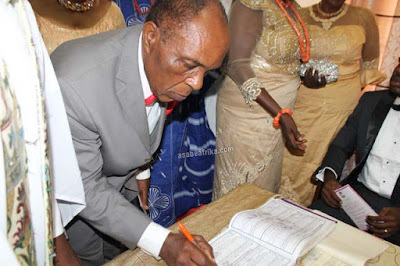 Until the wedding of his daughter, Uyi, nobody ever knew that Chief Abiola Ogundokun is the President General of the circumcision practitioners of Nigeria (Oloolas). His family in Iwo kingdom is said to be reputed for male circumcision of millions of babies in the Western parts of Nigeria. Hence, he is the reigning President General and National Patron of the body. 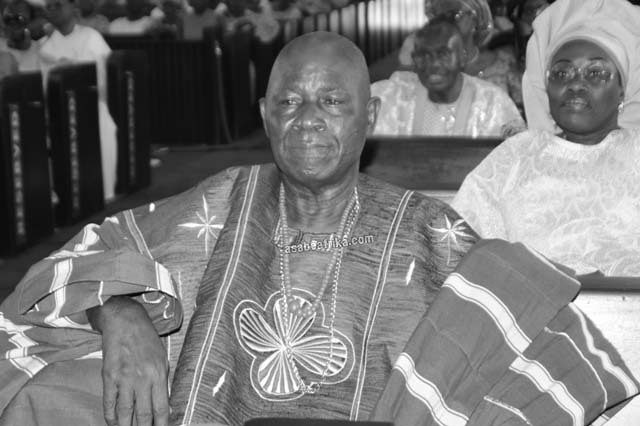 Chief Ogundokun a former National Publicity Secretary of the ruling National Party of Nigeria (NPN) under President Shehu Shagari’s government between 1979 and 1983 later held other prominent positions in People’s Democratic Party (PDP) between 1999 and 2015 when he retired from partisan politics at the age of 79. 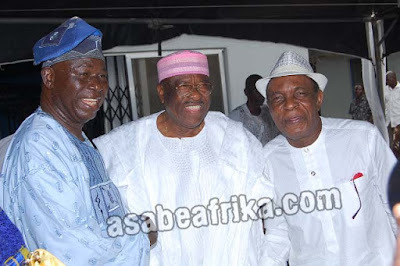 Ogundokun equally served as the Public Relations ambassador to late Nigeria’s maximum ruler General Sani Abacha in his short time rule and was famous for his image laundering activities for the late Kano born General. The Balogun Musulumi of Iwo Kingdom is the Publisher of Conscience International Magazine which he has published for 20 years. A league of traditional circumcision doctors from across Nigeria stormed the FESTAC home of Chief Abiola Ogundokun in Lagos for the traditional wedding of his daughter, Uyi to Osagie on Friday August 25th. 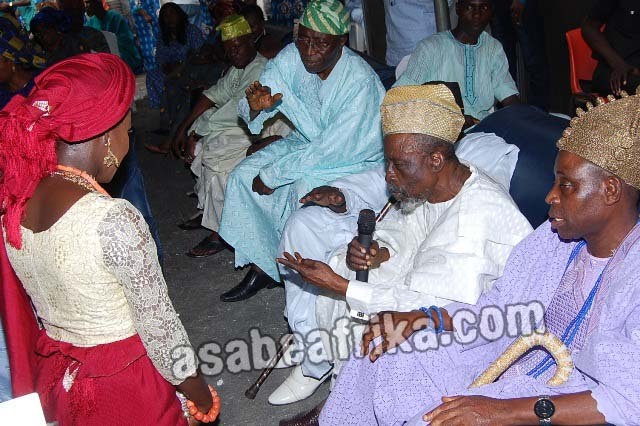 Leading the league of the over 50 members of the traditional male circumcision experts are Alufa Lukman Ogunsina the Vice Chairman of the Association. Others are A.A. Otunla and Yusuf Abdulatifu, organizing secretary and treasurer respectively. Others are Alhaji Lukman Ogumbamibi the 2nd trustee and Alhaja Kudirat Alabede, the 2nd trustee who led many other members like; Abiodun Awolowo, Babatunde Amusat, Muritala Ogunsina, Mufutau Abobade, Muheeb Ademola, Sefiu Yusuf, Moruf Ogungbinrin, Afolabi Ogundokun, Yekini Banuso, Mutiu Karimu and many too numerous to mention to Uyi and Osagie’s wedding to honor their President General and National Patron who is giving out his daughter in holy wedlock. He is a socialite per excellence and a very dynamic business man who is into oil and gas, real estate and hospitality. His name is Otunba Adisa Osi-Efa, an Epe born London trained administrator who has been a close friend of Chief Abiola Ogundokun for 45 years. Adisa Osi-Efa who is very popular among top Nigerian Musician like King Sunny Ade, Commander Ebenezer Obey, Alhaji Kollington Ayinla (Kebbe n Kwara) and many others icluding late Fuji Music Lord, Dr. Sikiru Ayinde Barrister (Alhaji Agba) Spent hoursat the event. 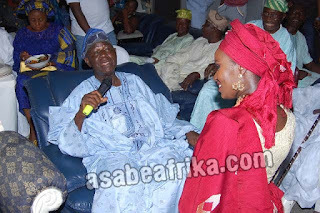 In his life time, Sikiru Ayinde Barrister released several albums in his name and honor describing him as “Omo Alufa Nla ton yagbole loojo”. 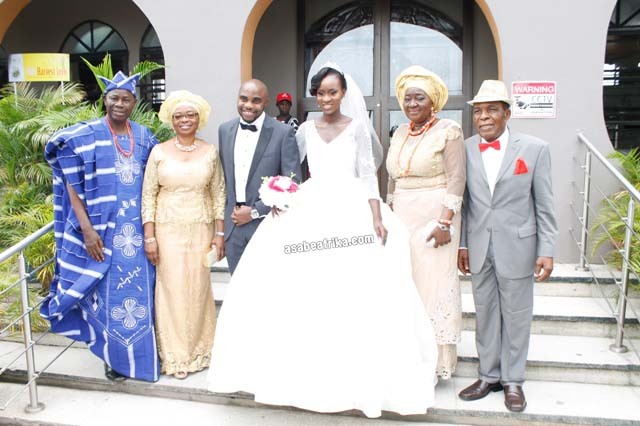 He was the first guest to storm Chief Ogundokun’s house for Uyi’s marriage. He spent 3 hours at the event before he left for other activities. 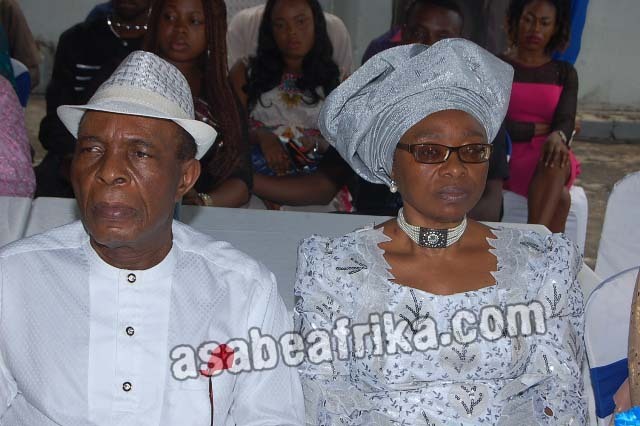 Another top political big wig who stormed FESTAC for Abiola Ogundokun’s daughter’s wedding is Senator Anthony Adefuye who arrived around 3pm. He stormed the event with his pretty wife, Mrs. Bolaji Adefuye. The Senator and his wife did not only felicitate with groom’s family but equally took some few dancing steps with the bridegroom and the Oluwo of Iwo kingdom, His Imperial Majesty, Oba Abdulrasheed Adewale Akanbi (Telu 1) who was very happy to have the ex-Senator of the Federal Republic of Nigeria around. By 4:55pm when Senator Adefuye was taking his leave, analysts adjudged him as ‘most sociable guest of the day’ as he did not just sit down but moved round to greet who is who and even danced with couple. 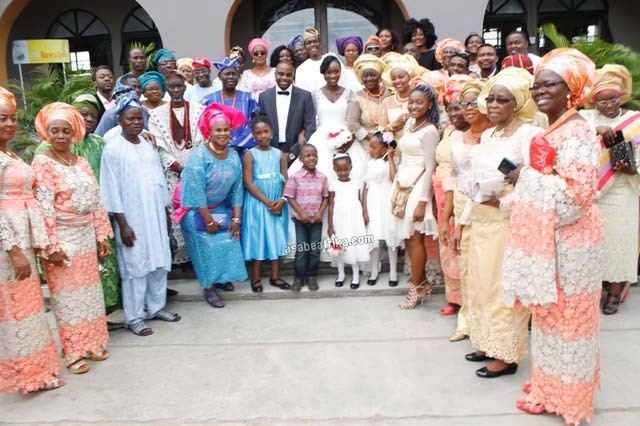 For those who don’t know much about the Yoruba culture and tradition of marriage, the wedding of Uyi Ogundokun and Osagie Elaiho was an open opportunity for many to learn how culture could play a role in a traditional marriage. Unfortunately, the Elaihos couldn’t drag the new Oba of Benin who is yet to be coroneted as at that time to their son’s wedding. However, Chief Abiola Ogundokun ensured that gap was filled with the invitation of his own traditional ruler, His Imperial Majesty, Oba Abdulrasheed Adewale Akanbi (Ilufemiloye TELU 1) Oluwo of Iwo land. The very young and dynamic Oba who is equally married to a Jamaican queen, Olori Chanel Akanbi did a wonderful job as he directed all the affairs of each segment of the event. 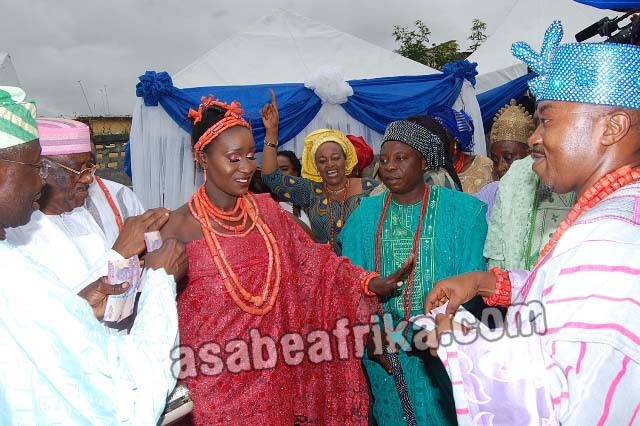 For instance, when the intention letter from the groom’s family was read by one Miss Boluwatife Olaoye from the bride’s family, the letter was read to the hearing of the king who quickly gave his royal authority to the bride’s father to accept the letter and bless the intention of the Elaiho family to take Uyi for their son, Osagie. Secondly, when Osagie and his friends came begging his bride’s family by prostrating, it was first to the king (Oluwo) who now gave his royal authority for the groom and his men to go to Chief Ogundokun for further blessing. 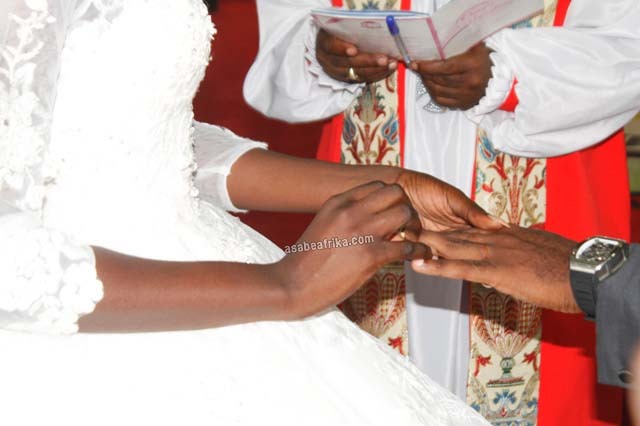 After the King’s position, the bride’s father had no other objection than to listen to the king who is like a spiritual moderator for the event. Again, when the groom family came to prostrate for the bride’s family, asking for Uyi’s hand in marriage, it was first to the Oluwo of Iwo kingdom who now released his royal blessings unto them before allowing them to face the bride’s parent who equally gave their blessings. 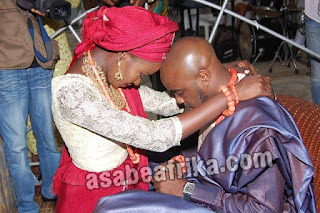 Lastly, the Oluwo and his Queen, Olori Chanel Akanbi offered ceaseless prayers for both Uyi and Osagie at various intervals, blessing their marriage for wealth, good health, long live, children and riches. 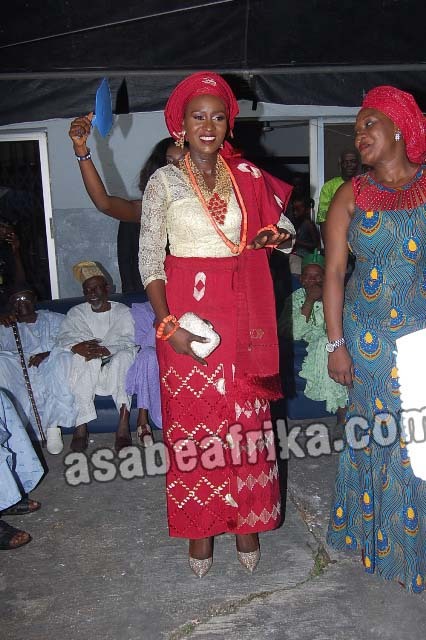 It was such an interesting moments as guests, well wishers and observers enjoyed the entire show of royalty by the Ogundokuns of Iwo land. Chief (Mrs.) Funmilayo Jabaru is a famous personality in Iwo land. She is the Iyalaje of Iwo Kingdom. 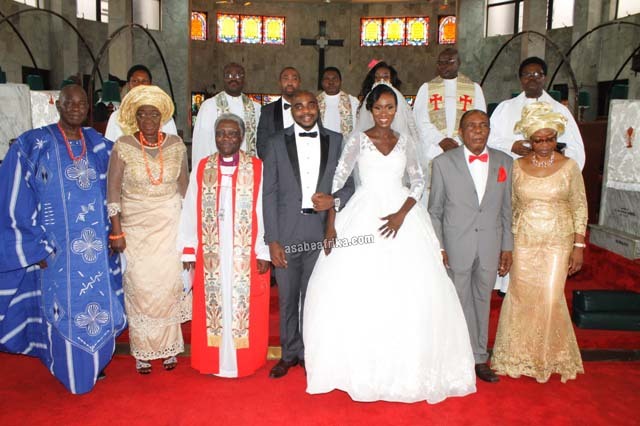 She stormed FESTAC for Uyi and Osagie’s wedding with legion of other ladies from Iwo town. It was such a gathering of titans from Iwo land. 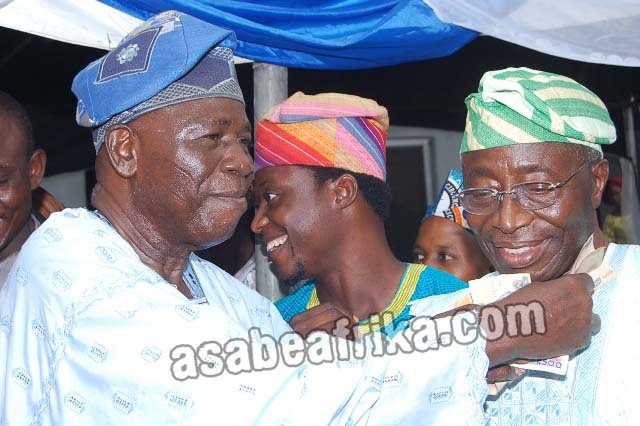 The Babaloja of Iwo land, Alhaji Asiru Ogundokun was in full gear at the event. He was the one who offered the Muslim Prayer as he equally led a team of traders from Iwo to the traditional wedding of Uyi Ogundokun and Osagie Elaiho. Chief Ismaila Alabi, the Baba Oba of Iwo land was also at the event and many other chiefs from the kingdom. 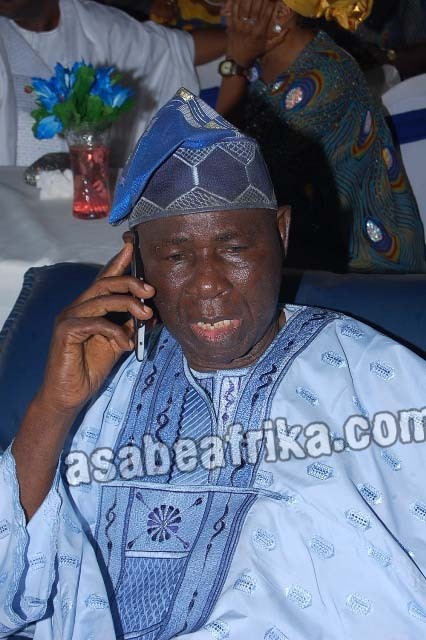 Chief Dele Olowe an Abuja based Medical practitioner is one of Chief Abiola Ogundokun’s passionate friends of over 50 years. He was at the August event. He was sighted after the event, telling some other VIPS inside Chief Ogundokun’s living room about the history of Iwo traditional Chieftaincy battles and the role Abiola Ogundokun played. 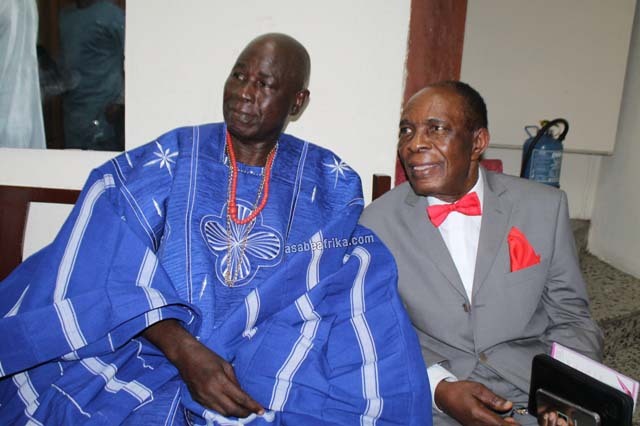 He described Ogundokun as a very de-tribalized and honest Nigerian; Chief Olowe also posses enough information on the Iwo born media baron’s political challenges from the second republic down to the fourth republic. His name is Chief Wole Ariyo a prominent Lagos socialite who is now a born again Christian. Chief Wole Ariyo, a former executive at Chevron Oil is the Bobagbimo of Alausa land in Ikeja area and Ajisetoba of Ikate land all in Lagos State. 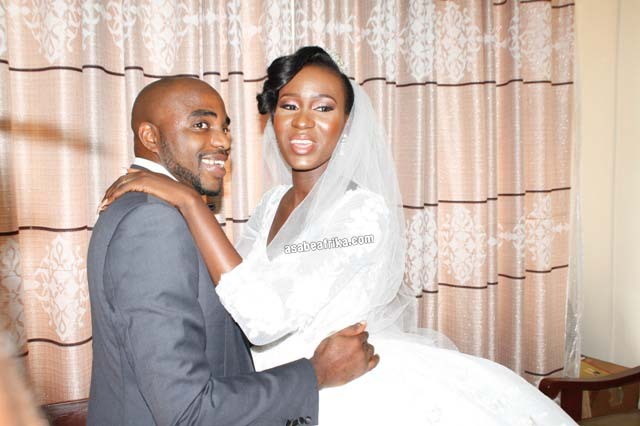 He is a member of the various social clubs in Lagos city namely; Island Club, Ikoyi Club, Eko Club and several other clubs. 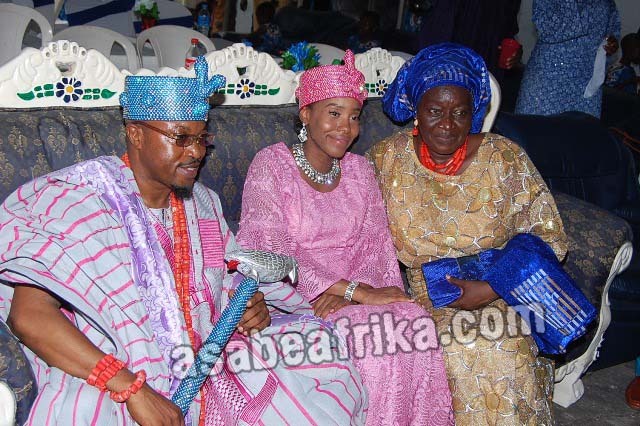 He is famously called ‘Baby Ariyo; Oyinbo Elepo’. 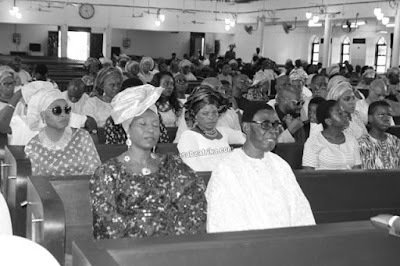 However, during the July 7th 80th birthday bash of High Chief Abiola Ogundokun, it was only ‘Baby Ariyo’ who dared to give the Iwo born Chief a BIBLE as gift. 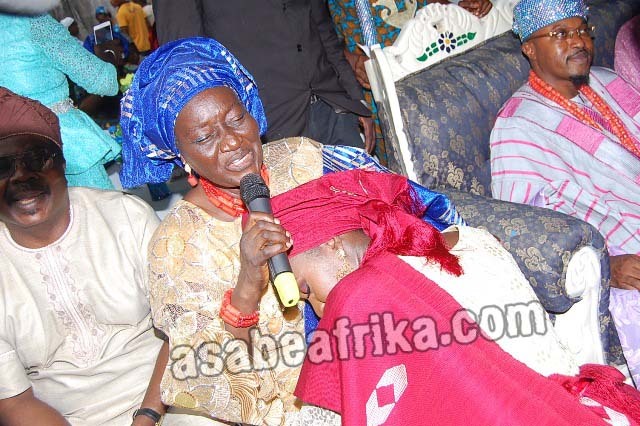 Chief Wole Ariyo wants Chief Abiola Ogundokun who is the Balogun Musulumi of Iwo land to accept Jesus as his Lord and Savior. 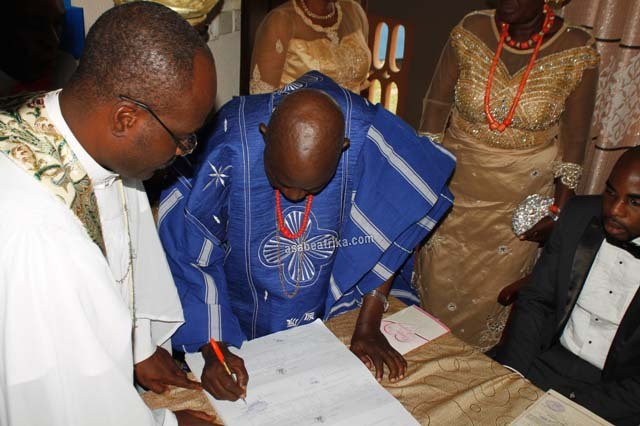 Even though it appears this Oyinbo Elepo is serious with his intention to convert Chief Ogundokun to Christianity, it is now left for him to find time to perfect the science of making it happen as he already gave Ogundokun a very big bible for his 80th birthday. 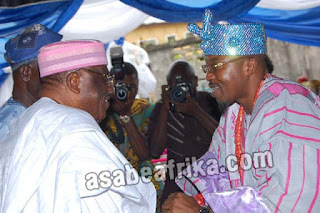 Chief Ariyo described Chief Ogundokun as ‘a man who speaks truth to power irrespective of his interest or pocket’. 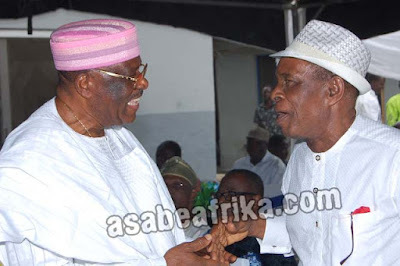 “He is a great man, a very sincere Nigerian, a straightforward fellow and someone whom you can rely on for his word. His word is his bond and that is why corrupt politicians fear him”. Seems like a good testimony. Isn’t it? He is the youngest of High Chief Abiola Ogundokun’s friends. 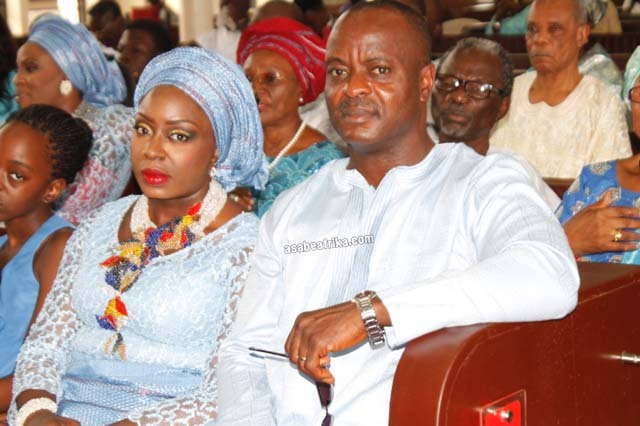 His name is Adesoji Adeniyi, he was at the event with his wife, Bamidele. 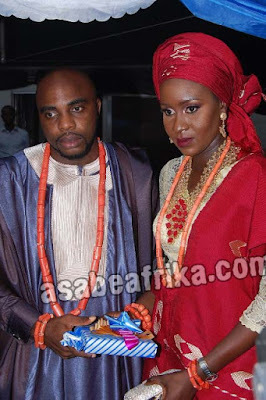 They both run merchandising company called Sorjion Jenera Nigeria Ltd. They have known Chief Ogundokun for ten years. They were sighted sitting with the Chief inside his living room after the event closed and didn’t leave until late in the night. 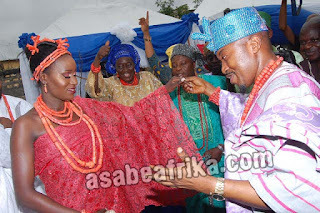 Guests were surprised to see the youthful Oluwo of Iwo land; His Imperial Majesty Oba Abdulrasheed Adekunle Akanbi stormed the dancing floor to dance his hip out with the bride and her groom. The Oba who at a time warned his bouncers not to push people off him extended his humble gesture to guests, well-wishers and friends of the Ogundokuns and Elaihos as the Kabiyesi danced, danced and even sprayed guests with cash not minding the ongoing recession in the country. The very handsome and dashing Oba became the cynosure of all eyes as he choose his dancing steps carefully. 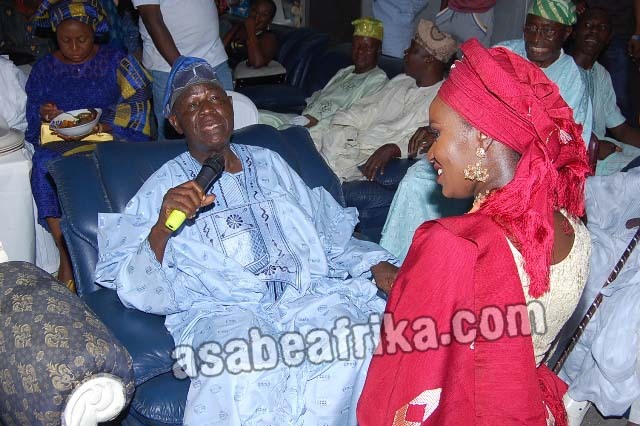 Everyone was surprised as they never believed their eyes that a top traditional ruler of his caliber could become so humble and blend with ordinary citizens. 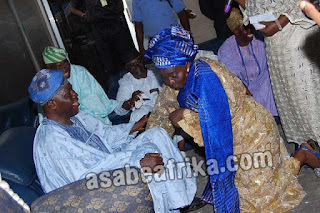 The Kabiyesi equally danced with his host, Chief Abiola Ogundokun for almost twenty minutes, danced with bride’s mum and legal expert, Madam Usulobu Erhabor who was so overjoyed with the turnout of event for her daughter. 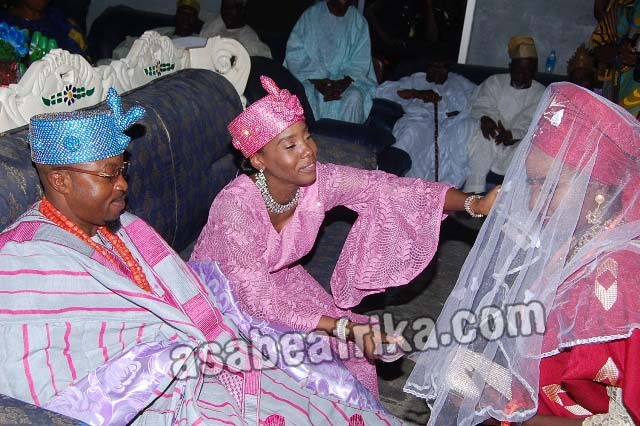 The Kabiyesi later had a special dance with Uyi, the bride as Osagie the groom looked on in wonderment. 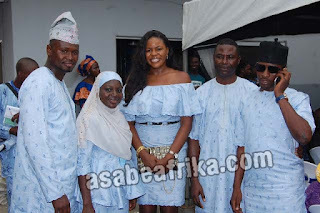 By the time Kabiyesi finished and was about to go, a crowd of loving Nigerians who have fallen in love with him ‘arrested’ him for over 30 minutes having photo ops with the Kabiyesi Alayeluwa. 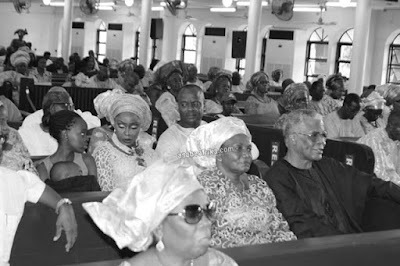 Kabiyesi later left for his hotel somewhere in town after spending six hours with the Ogundokuns. 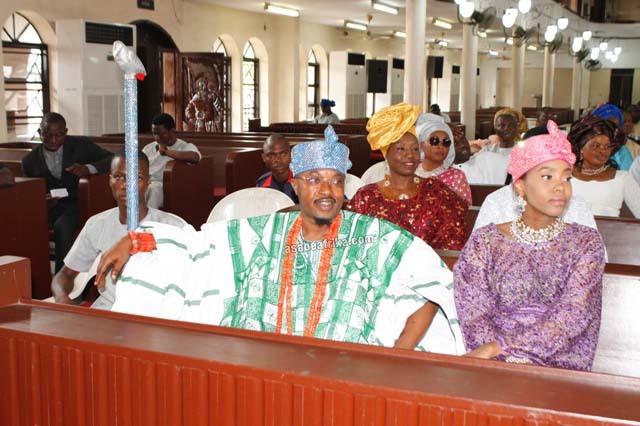 On Saturday August 27, the Oluwo of Iwo Land, Oba Abdulrasheed Adewale Akanbi (Ilufemiloye—TELU 1) and his Queen, Olori Chanel Akanbi (Ilufemiloye TELU 1) led a team of top traditional rulers from the South Western part of Nigeria to Arch Bishop Vinning Memorial Church where the white wedding ceremony between Uyi and Osagie took place in the presence of friends, family and eminent Nigerians like Chief Sunny Asemota who is a very close friend of the groom’s dad. 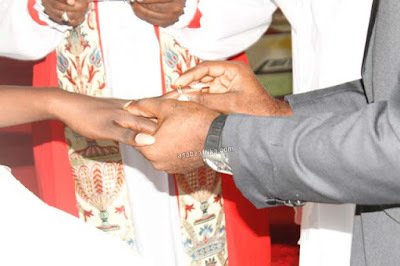 It was a great occasion as the church’s Priests gave Biblical lecture and references to both the groom and the bride on how to manage a successful marriage and what is expected of them as couple. Later, both families signed dotted lines at the Vicar’s office and both declared husband and wife. 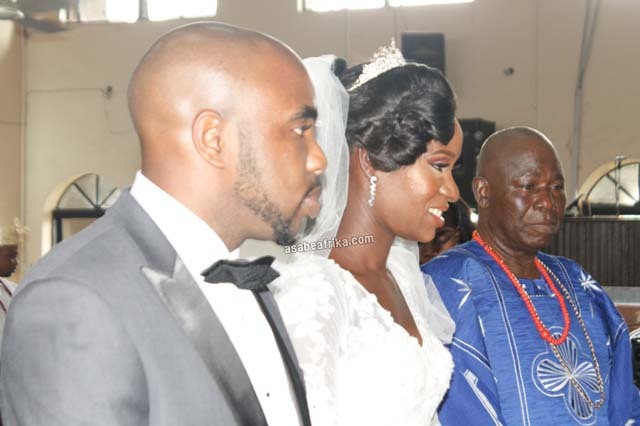 A grand reception later took place at the groom’s father’s event center somewhere in Opebi area of Ikeja-Lagos State.